For over 135 years, we have been transforming steel wire and applying unique coating technologies. Every day, we continuously improve both the bulk and the surface properties of our steel wire products. We draw steel wire in different strenghts and diameters, even as thin as ultrafine fibers of one micron. We bundle the wires into cords, ropes and strands, profile them into complex shapes, weave or knit them into fabric, or process them into an end product. Depending on your application, coatings are applied which reduce friction, improve corrosion resistance, or enhance adhesion to other materials. Discover our products and applications by browsing your industry below or through the advanced search. In the automotive sector, we set ourselves apart by consistently creating high-quality and innovative products that are tailored to our customers’ needs. This sector is the largest user of Bekaert products and accounts for 37% of combined sales. 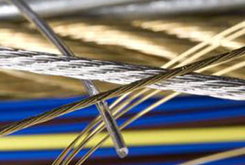 We supply specialized wire products that meet the highest quality standards. By offering wire, mesh and fiber products in numerous construction applications, we tirelessly seek out more environment-friendly solutions with a focus on better materials, greater safety and lower energy consumption, all with an eye on cost-efficiency. This sector accounts for 23% of combined sales. Whether it concerns onshore or offshore oil extraction, gas mining, power transmission, solar energy, or even telecommunications, Bekaert products are key contributors to sustainable, safer and more cost-effective operations. This sector counts for 13% of combined sales. Across the agricultural sector, Bekaert provides innovative solutions that make day-to-day work easier. Through our global footprint and our mix of trading and manufacturing, we can offer total packages to our customers. As higher quality and comfort standards and functionalities are required, the demand for more advanced coated steel wire products evolves accordingly. The wide range of applications for Bekaert wire attest to our success in satisfying diverse customer requirements. Bekaert is present to meet their needs. To sum it up: often unseen, but always there: Bekaert is a part of the products we all use every day. Many Bekaert products are used in exploring and producing raw materials, from coal and metals to pulp and paper, to chemicals and textiles. We make cable and wefts for conveyor belts that are used across many industries. We continue to find new ways to become a partner at every step of the value chain. Bekaert supplies heavy equipment makers and operators with a range of specialized wire product components. As we build our own proprietary machinery, we know exactly what it means to make high-performance equipment. This allows Bekaert to focus on innovation and manufacturers to focus on operational excellence. Select your product category to do an extended search on technological features, processes and transformations to find your ideal solution.